Pioneers in the industry, we offer mash feed plants, horizontal feed mixers, mesh feed plants and complete feed mill from India. 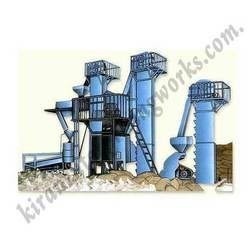 Owing to our rich industrial knowledge, we are keenly successful bin presenting Mash Feed Plants. We offer these at reasonable rates. 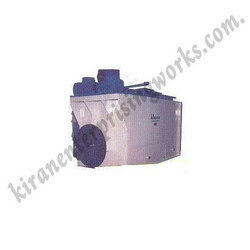 We are the leading manufacturer and supplier of Horizontal Mixers. They produce a homogenous mix of ingredients. Molasses, Liquids. Fats Can Be Directly Added. For removing both the over size & fines, we need double deck screener. We are the leading manufacturer & Supplier of Mash Feed Plants for both poultry & cattle . We are the leading manufacturer and supplier of Complete Feed Mill. Further, these are available in customized specifications as per the requirements of our clients to meet their exact requirements. The fitness of the grinding is adjusted changes of perforated screens, which can be done within minutes. For making pellets, the above mixed feed coming out of the out-let hopper of the Mixer is again allowed to fall into another under-ground pocket in which 3rd Bucket Elevator-III is installed. This Bucket Elevator automatically lifts the mixed feed and feeds it into the Storage Bin fitted fitted over the Palleting Machine. From this Storage Bin, the mixed feed is poured into the Palleting machine. The mixed feed is sterilized with steam for which steam-connection is provided to the Palleting Machine from the Stream Boiler installed by the side. The sterilized mixed feed then passes into the die. fitted into the Pallet Mill which makes the pallets of required diameter. size. The pallets so made are automatically out to size and fall below on the Pallets Cooler fitted underneath. The Pallets so cooled are Either sieved for dust removal and collected into gunny bags through automatic fall Or alternatively if Pallets are to be crumbled then instead of the Sieve a Crumbling Machine installed underneath receives the cooled pallets and crumble the same. 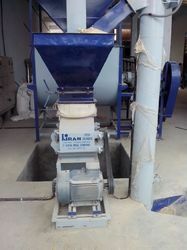 The crumbled pallets again fall into another underground pocket in which 4th Bucket Elevator-IV is installed which automatically lifts the crumbs and carry the same to the Sieving Bed which removes the dust from the crumbs on one side and the clean crumbs on the other side from where the crumbs are bagged. The bags so filled with Either the Mesh Feed OR the Pallets Or the Crumbs are weighted on the Weighing Machine provided and then stitched with the help of a hand stitching machine. These bags are then removed for being stacked at the stacking place. Looking for Feed Mills & Plants ?